Stems: Mostly erect, 1-4, unbranched, glabrous. Leaves: Opposite, simple, stalked below, sessile and clasping above, obovate to spatulate below, lanceolate above, 1 to 5.5 inches long, .5 to 1.5 inches wide, glabrous; margins entire to slightly toothed; tips rounded or pointed; uppermost leaves distantly separated from inflorescence. 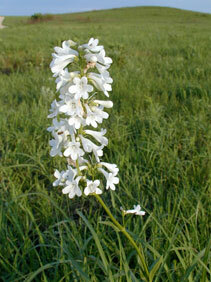 Inflorescences: Panicles, elongate, 3 to 16 inches long, with 4-12 distinct, whorl-like clusters of 3-9 flowers. Flowers: Calyces 5-lobed, lance-ovate, glandular-hairy; corollas trumpet-shaped, .5 to 1 inch long, bright white, slightly 2-lipped, upper lip 2-lobed, lower lip 3-lobed, sticky glandular-hairy internally and externally; throat guidelines absent; stamens 5, 4 fertile, 1 sterile with short yellow hairs. Fruits: Capsules, egg-shaped, 1/4 to 1/2 inch long, woody; seeds numerous, tiny, brown. Habitat: Moist or dry prairies, open woodlands, roadsides, and disturbed areas, on loam or sandy loam soils. Comments: The name is an allusion to the shape of the flower.